Energy Drinks: Why The Need for So Much Caffeine? It used to be the only thing caffeinated in our diet was coffee and tea and perhaps the occasional soda. But over the past few years it’s an additive that’s crept into everything from sports drinks to jelly beans. This week, Cracker Jacks announced plans for a new line of caffeine-infused Cracker Jack’D Power Bites. The Center for Science in the Public Interest is none too pleased we’re turning into Caffeine Nation. They view it as a potentially dangerous trend. They might be right. 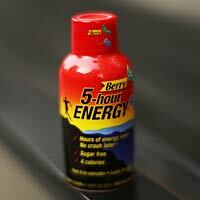 The U.S. Federal Drug Administration recently released records naming Monster Energy and Rock Star Energy Drink as a factor in injury reports, while the drink 5-Hour Energy has been mentioned in at least 90 injury reports including 33 hospitalizations and 13 deaths in the past 4 years. Although such reports don't prove the drink was responsible for the injuries or deaths, many energy drinks contain massive amounts of caffeine per serving. A 2011 Pediatrics study found that the total amount of caffeine contained in some cans or bottles of energy drinks exceeded 500 mg or the equivalent of 14 cans of caffeinated soft drinks. This, they concluded, was a high enough amount to induce caffeine toxicity especially if several servings are consumed in a brief period of time. Drink makers say their products are safe and unrelated to the problems reported to the F.D.A., says Michael Jacobson, PhD, the Center’s executive director, who concedes that it’s unclear why the energy drinks have been associated with so many deaths--while coffee, which also is consumed in large quantities, has not been. “It's possible that there is some interaction between caffeine and other ingredients,” he said. Or, it’s possible that the deaths were not caused by the energy drinks. But CSPI’s biggest concern is that the door is now open for adding a java jolt to all sorts of products, especially ones that are attractive to teens and younger kids.